This chapter sets out the theoretical background to the research. It critically examines the existing approaches in understanding disruptive technologies and their limitations. I then discuss the major theoretical perspectives that guided this research—Social Shaping of Technology (“SST”) (MacKenzie and Wajcman in The Social Shaping of Technology: How the Refrigerator Got Its Hum, Open University Press, Milton Keynes, 1985; Williams and Edge in Research Policy 25:865, 1996) and its extension into Social Learning in Technological Innovation (“SLTI”) (Sørensen in Learning Technology, Constructing Culture: Socio-technical Change as Social Learning, University of Trondheim, Trondheim, 1996; Williams et al. 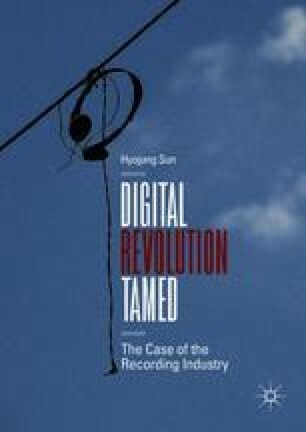 in Social Learning in Technological Innovation: Experimenting with Information and Communication Technologies, Edward Elgar, Cheltenham, 2005)—and explain why they serve as valuable frameworks in understanding digital disruption in the recording industry. Drawing upon these theoretical approaches, I present a framework of “Socio-technical Constellations of the Digital Recording Industry” to demonstrate a more complete and sophisticated account of the digital recording industry.